RANGE: Found in the warm ocean waters of the Atlantic, Indian and Pacific oceans. Located from Australia to Japan, southern Brazil to the British Isles. Also, found off of the southern coast of Florida, the Gulf of Mexico, and the Caribbean Sea. HABITAT: These turtles live in the clear offshore waters off the mainland and on island shelves. Hawksbill Sea turtles are more commonly found in the locality of coral reef formations. They usually nest in the same proximity of the coral reefs. Hawksbill Sea turtles, however, tend to use many different habitat locations throughout their life cycle. DIET IN THE WILD: Hawksbill Sea turtle's, are omnivorous and have a widely variegating diet. Their diet consists of small sea grasses and plants found in different ocean depths and includes invertebrates, such as crustaceans, jellyfish, mollusks, sea urchins and sponges. WARNING: IF YOU GIVE A HOOT, DO NOT POLLUTE. At times these beautiful creatures mistake balloons, debris and plastic material pieces as food. This can in turn lead to a wide range of illness in these turtles or even death. DIET IN THE ZOO: 50 grams of Capelin (a small fish), 50 grams of squid and 60 grams of Aquatic Omni gel. This is a food gel which contains many necessary nutrients and vitamins vital to the Hawksbill Sea turtle that it normally does not find in captivity. LOCATION IN THE ZOO: The Hawksbill Sea turtle is located in the Texas Gulf Coast area of the Texas Wild Exhibit. It is housed in Alexander's Bait Shack. MASS: on average 45 kilograms. WEIGHT: Hawksbill Sea turtles can weigh up to 270 pounds and can grow an outer shell (carapace) length of around 3 feet. As newborn hatchlings these turtles weigh less than half of an ounce and contain a small carapace length of 1-1/2 inches. COLOR: These beautiful turtles are infamously known for their prized carapace (their outer shell). Their shell can vary in color, due to the different geographic location that the turtle may reside in. The contrasting color found on the turtle's shell helps camouflage the turtle and aids it as a defense mechanism. The shell color is usually mottled brown with dark and light spots or streaks. 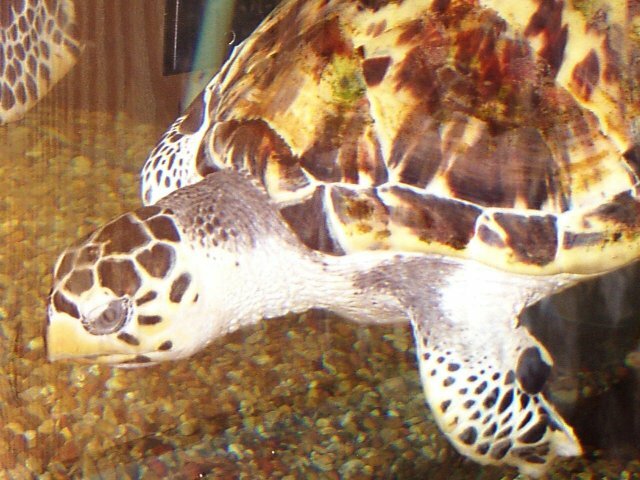 Hawksbill Sea turtle's undersides are light yellow or white. The Hawksbill Sea turtle has two pairs of prefrontal scales on its carapace. It also has thick posterior overlapping scutes along with 4 pairs of costal scutes. This sea turtle has two claws on each flipper and a beak like mouth. 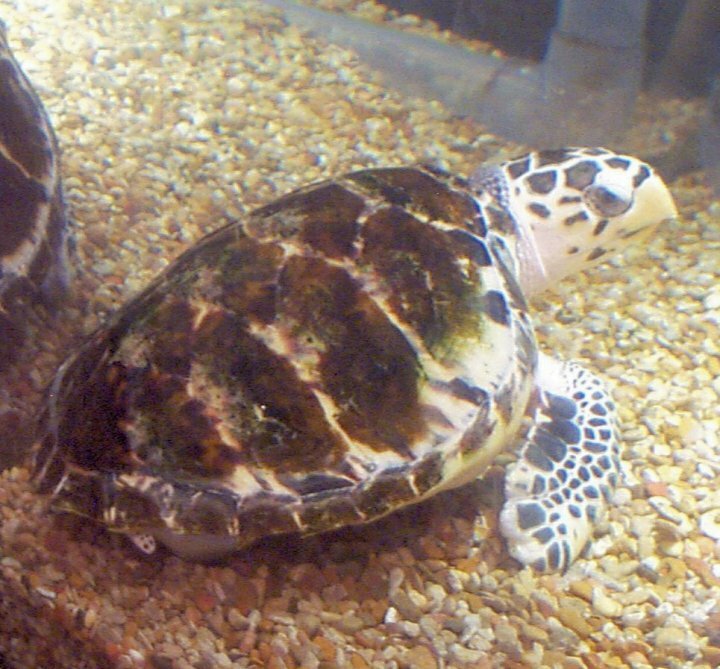 The above features help in uniquely distinguishing the Hawksbill Sea turtle from all other sea turtles. 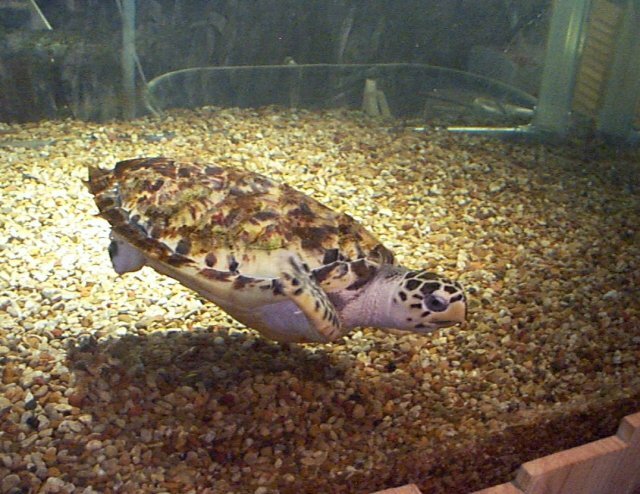 The Hawksbill Sea turtle at the Fort Worth Zoo is housed in a medium sized standing aquarium. The turtle lives on its own. The turtle is on loan from the University of Texas Marine Science Institutes Rescue. 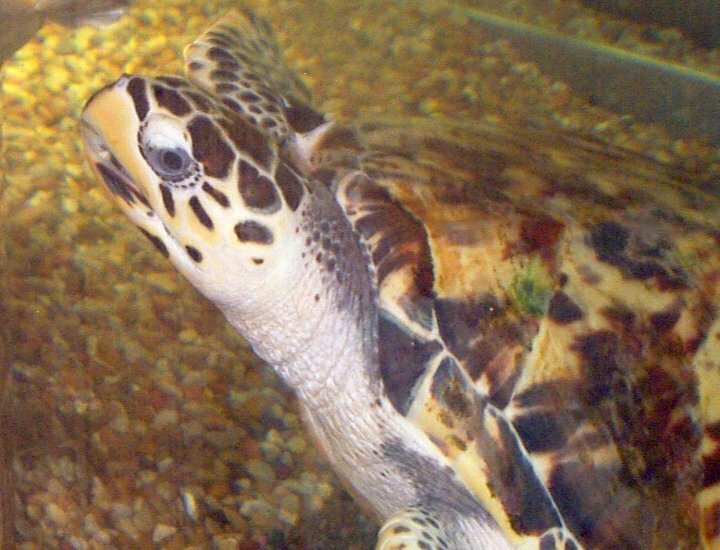 ACKNOWLEDGMENTS: I would like to gratefully thank zoo keepers, Mike Maslanka and Blanca Zarate, for their continuous dedication to helping the animals at the Fort Worth Zoo and for helping me learn more information about the Hawksbill Sea turtle. Finally, I would like to thank my fellow classmates for continuously editing my web page drafts and Dr. Clark for enlightening and enhancing our brains to the never-ending world of Biology.